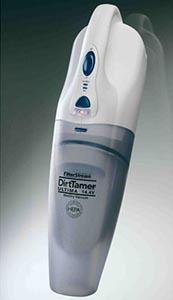 DirtTamer is known for quality vacuums, and they’re putting the DirtTamer Ultima V2510 Cordless Wet/Dry Hand Vacuum out there as a vacuum on the higher end of their brand. Does it live up to that quality reputation? Let’s take a look and find out. Wet/dry vacuums need a fair amount of power to function well, especially with wet messes. Luckily, the Ultima lives up to that need with 14.4 volts of power. That’s on the higher end for handhelds, and is quite enough to clean liquids. DirtTamer’s good reputation holds true especially in this quality. While it doesn’t have the highest power I’ve seen for a handheld, it’s just about a close second, and because of its design it sure seems like it has a lot more. You’ll really see it when you’re dealing with more complicated, heavier messes like, say, spilled cereal. The Ultima practically molds to your hand in both obvious and subtle ways. The obvious way is easy to see even in photos: an ergonomic loop handle that most handhelds sadly don’t bother with. The more subtle side of it is much easier to feel than see – the vacuum has a specially placed center of gravity to make maneuvering and carrying the Ultima’s weight a breeze. A locking on/off switch complements these features so not even your thumb will get tired. This vacuum has a fantastic runtime for a handheld at ten minutes – given handhelds are made to be used for small messes and spot cleaning, that is much more than enough time to get the job done. Its NiCad batteries may not charge as fast as Lithium-Ion, but it’s not really a concern when the runtime is that long. At 4.7 pounds, the Ultima is a solid weight for a handheld, but as I noted in the Ease of Use section, the loop handle and specially placed center of balance mean you’ll barely feel it. DirtTamer’s Ultima has fantastic filtration that combines both HEPA and foam in a three-stage system. Most vacuums have perhaps one or two foam filters, and the better ones have HEPA filters, but it’s a rare vacuum – especially a handheld – that combines the two. Given that the Ultima is a handheld vacuum, its dust bin isn’t particularly large, with twelve ounces available for dry mess, and nine ounces available to hold wet mess. DirtTamer includes three accessories with the Ultima. An upholstery brush complements the ease with which you can lift a handheld to clean furniture and your car, and a 13” extendable wand really gets into the crevices of the same. For wet messes, a squeegee tool helps keep the mess contained. This vacuum has the quality to actually be reliable for years…with one caveat. Make sure the battery is properly discharged – many people have complained about poor reliability with NiCad batteries, but that is often because they are using it incorrectly. The Ultima comes with a two year limited warranty, which is great for a handheld vacuum. While there is no battery warranty, NiCads really do have the potential to work well for years. This vacuum has a middle-to-high cost for a handheld, but taking into account its quality and versatility, when you look at it as an investment it’s easy to pay that price. If you want a vacuum capable of cleaning up both wet and dry messes but you don’t want to put too big of a dent in your wallet, the DirtTamer Ultima is the vacuum for you. It’s great for small messes of all the varied types that can happen in the kitchen or out, and it has the power to do well on the pet hair and debris that can collect on your furniture and car seats. It’s really a lot in a small package.